bookitLive gives you the freedom to deliver your customers targeted and strategic communications at multiple points in the booking process. Remain fresh in their minds and provide them with information that suits their precise needs by delivering confirmations, reminders, marketing and more. Then manage and filter your client database using the powerful software backend. bookitLive makes it simple to track trends and demographic data with the simple-to-use client management system. Send one-on-one and mass communications that promote new services or appointment to secure repeat visits. With bookitLive, you can build a custom communication schedule that allows you to remain front-of-mind and relevant to your customers so they’ll think of you first, whether you’re sending a promotion, a reminder about a fitness session or communication about an upcoming event. You can add as few or as many functions as you like to your bookitLive service. 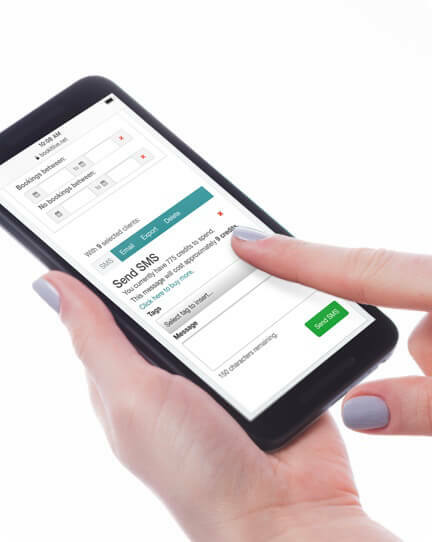 Give your customers the swift booking experience they’re after with secure online payments, simple booking process, smart forms and helpful appointment reminders. Save time and money by outsourcing your repetitive tasks and user journeys to the powerful software.